Today, the second day of service, was the first day our group was invited to go to The Catty Shack ranch and wildlife sanctuary. We woke up as a group around 7:30 excited to start our brand new adventure. When we got there, the regular volunteers greeted us with an array of tasks they needed done. 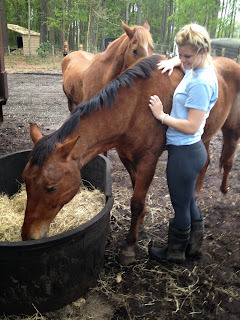 They needed us to do everything from organizing, painting and cleaning horses. The group was split up into teams in order to accomplish these tasks. We found that we shocked the employees with how quickly we were completing tasks and we got to get more things done than they had originally anticipated. We felt more than accomplished as a group after leaving the sanctuary at 1 P.M. today. Again, like yesterday, we felt like doing actual tasks that the volunteers needed us to do made us realize our instant impact on the sanctuary. We think that this may be even more satisfying than doing normal everyday tasks because we know that we are accomplishing things that will help the employees for many years to come. Although we didn't get to see any tigers today, we were thoroughly educated by the handlers at The Catty Shack. They told us they hold 25 tigers, 5 lions, 2 coatimundis and 2 lynx on their 10-acre property. All of their cats are born in captivity and rescued from other locations. None are taken from the wild. They also have three rescued horses and dozens of chickens on their land as well. We learned a lot about how they care for the animals and how the educate their visitors and although we didn't get to see any today (besides glimpses and roars) they promised us a full tour when we go back tomorrow. Below, is each of our individual highs/lows for the day. We think this is an amazing way to reflect on our experiences and look forward to the upcoming adventures.